I always liked the tale of Cinderella, but by the time I could read on my own, I looked for stories of real people who sometimes felt out of place but ended up somewhere amazing. I especially like reading about girls who weren’t given great chances, but through faith and hard work, rather than wands and fairy godmothers, made a mark on the world. These days I often write poetry, which asks us to pay close attention to language and may bridge nonfiction and fiction. I enjoyed contributing to the Poetry Friday Anthologies edited by Janet Wong and Sylvia Vardell, which help make it easy for teachers to fit poetry into the week. It was fun to write biographical poems for The Poetry Friday Anthology for Science, but later I wanted to write more than could fit on one page. That desire led me to compose a series of poems about girls whose early love of science led them to important discoveries. 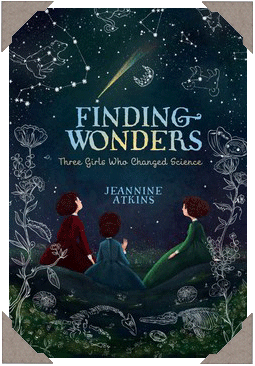 Finding Wonders: Three Girls Who Changed Science celebrates three girls born in three different centuries who went on to do groundbreaking work. Most of the poems show Maria Sibylla Merian, Mary Anning, and Maria Mitchell at about thirteen years old, when their commitment to studying plants and animals, fossils, and the night sky deepened. The final poems in each series present the highlights of their extraordinary careers. 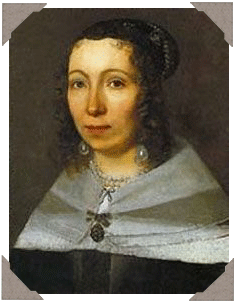 Back when insects were commonly believed to come from mud, Maria Sibylla Merian (1647–1717) found and raised caterpillars, discovering how they transformed into moths or butterflies. As an early ecologist, she painted insects along with the plants that provided their food and shelter. She may have been the first person to take a voyage (from Europe to South America) for purely scientific reasons. Her paintings of flowers and insects can be found today in many museums. Learn more about Maria on Pinterest. 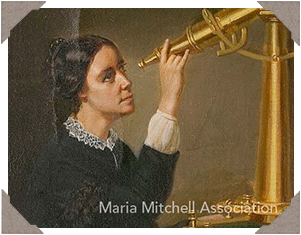 Maria Merian, Mary Anning, and Maria Mitchell all had fathers who encouraged their curiosity about the natural world. They also all lived during a time when science was developing, and was more interwoven with art, literature, and religion than it tends to be now. While an emphasis on looking long and hard remains, those doing science in earlier centuries often depended on what an unaided human eye could see, and the arts, which help sharpen vision, were a common part of a naturalist’s education. Religion and science were sometimes at odds, but many, including these three girls, found ways to unite them. 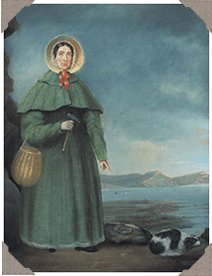 They also found beauty and mystery in poetry, which both Mary Anning and Maria Mitchell included in their daybooks. Paying close attention, discovering, making mistakes, and being disappointed or astonished, all three scientists explored what was hidden: the origins of caterpillars and moths, the world’s history as written in stone, and what can be seen in the sky only with telescopes. Available at Amazon, Barnes and Noble, IndieBound. Read the Finding Wonders Timeline. Learn how to write a historical poem with Researching a Way into a Poem - with Poetry Prompts. “In the scramble for STEM curricular materials that celebrate the contributions of women scientists, Atkins’ offering of three extended free-verse biographical poems is distinguished for both content and elegance." "Inspirational and informative, Atkins shows how pursuing one’s passion for science, math, or any field considered nontraditional is worth the risk."